NEW YORK ( TheStreet) -- Citigroup ( C was the big winner among the largest U.S. financial names on Wednesday, with shares rising over 6% to close at $36.46, after the company announced a major initiative to cut expenses and narrow its focus. The Dow Jones Industrial Average and S&P 500 ( SPX.X both saw slight gains, while the NASDAQ Composite rose 0.5%, after shares of Apple ( AAPL recovered over 1%% to close at 546.09%, following the previous session's 6% drop. One of the worst performers on Thursday was Freeport-McMoRan Copper & Gold ( FCX which tumbled another 4% to close at $30.81 after a 16% drop on Wednesday, which followed the company's announcement of two pricey acquisitions. Freeport-McMoRan agreed to pay $6.9 billion in cash and stock to acquire Plains Exploration & Production Co. ( PXP, and $2.1 billion to acquire the 64% of McMoRan Exploration ( MMR that it doesn't already hold. The $50 per share valuation for PXP represented a 39% premium over the oil driller's closing price of $36.05 on Tuesday. The $14.75 per share cash consideration for McMoRan Exploration was a 74% premium to that firm's closing price of $8.46. Jim Cramer said that the Freeport-McMoRan didn't pass the " smell test," as the company and McMoRan Exploration are both chaired by James Moffett, and MMR "become a free-falling stock of late courtesy the missteps" in a large drilling project in the Gulf of Mexico. Cramer also said that the two acquisitions were "hardly arms-length deals," as Plains Exploration "owns 31.5% of McMoRan and Plains' CEO, Jim Flores, is on the board of McMoRan." With so many questions concerning the deals, it was hardly surprising to see the stocks of all three companies decline. Shares of Plains Exploration were down 3% to close at $43.18, while McMoRan Exploration was down 5%, closing at $15.02. Turning back to financials, the KBW Bank Index ( I:BKX rose slightly to close at 48.78, after the Labor Department said that initial unemployment claims for the week ended Dec. 1 fell 25,000 to 370,000, coming in lower than the consensus estimate of 380,000 among economists, according to Briefing.com. The prior week's claims were revised upward to 395,000. Continuing jobless claims for the week ended Nov. 24 fell by 100,000 to 3.21 million from the preceding week's upwardly-revised level of 3.305 million. 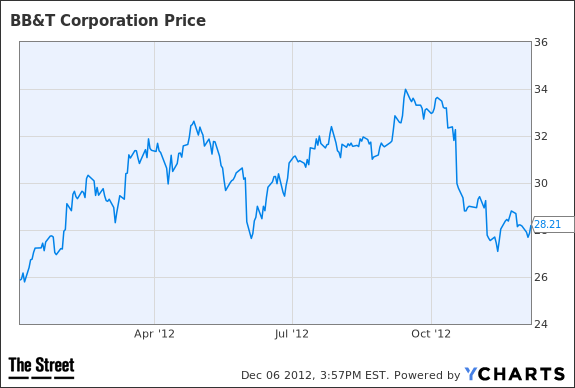 BB&T's shares have now returned 15% year-to-date, following a 2% decline during 2011. The shares trade for 1.7 times tangible book value, according to Thomson Reuters Bank Insight, and for 9.6 times the consensus 2013 earnings estimate of $2.93. The consensus 2014 EPS estimate is $3.18. Based on a quarterly payout of 20 cents, the shares have a dividend yield of 2.83%. BB&T's dividend is certainly attractive for a stock in the low-rate environment, with the payout well-supported by a solid 12-month operating return on average assets of 1.04% through the third quarter, according to Thomson Reuters Bank Insight, and an estimated Basel III Tier 1 common equity ratio of 8.0%, as of Sept. 30. Following the next round of Federal Reserve stress tests in March, Bank of America Merrill Lynch analyst Erika Penala expects BB&T to raise its quarterly dividend by penny, but not to request approval to buy back common shares during 2013. However, the analyst said in a Nov. 26 report that BB&T is among the banks "that still have the opportunity to lower their funding costs calling expensive debt as part of their capital planning process for '13, which could help partially mitigate margin compression." Most large banks are facing narrowing net interest margins -- the difference between the average yield on loans and investments and the average cost for deposits and borrowings -- as the Federal Reserve has kept its short-term federal Funds rate in a target range between zero and 0.25% since late 2008, and has also been purchasing $85 billion in long-term mortgage backed securities and U.S. Treasury securities each month, in an effort to hold long-term rates at historically low levels. Penala estimated net interest margin "accretion of 14bp for BBT," from debt redemptions and some new debt issues at lower rates, following the stress tests, which "would translate into an EPS boost of 15c (5%)" for the company in 2013. The analyst rates BB&T a "Buy," with a price objective of $32.00. Interested in more on BB&T? See TheStreet Ratings' report card for this stock.